In contrast with auxiliary verbs, which help create compound tenses and moods, semi-auxiliary verbs are used with infinitives to influence their meaning, tense, mood, or aspect. 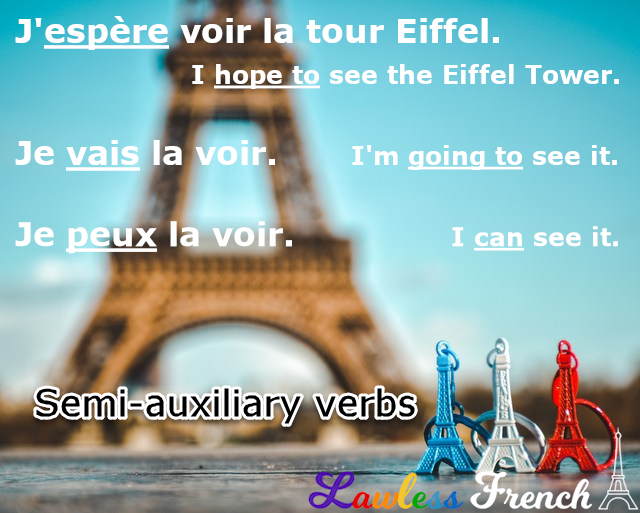 Some French semi-auxiliaries are equivalent to English modal verbs, and most of the top 10 French verbs can or must be used as semi-auxiliaries. Whenever a verb is followed directly or indirectly by an infinitive and the subject of the two verbs is the same, the first is being used as a semi-auxiliary. J’espère voir la tour Eiffel. 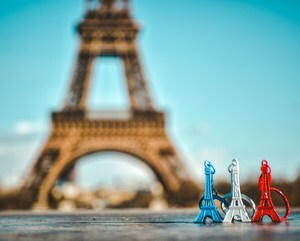 I hope to see the Eiffel Tower. J’essaie de lire. I’m trying to read. Je vais me brosser les dents. I’m going to brush my teeth. J’hésite à te le dire. I hesitate to tell you. As you can see, there may be prepositions and/or pronouns in between the semi-auxiliary and the infinitive. The semi-auxiliary can also be conjugated into different tenses and moods. Je voudrais la voir. I’d like to see it. J’ai refusé de lire. I refused to read. Je pourrai me brosser les dents. I’ll be able to brush my teeth. Je pensais te le dire. I was thinking about telling you. This list is not definitive, but it should give you a good sense of how semi-auxiliaries work. Click the links on the left for conjugation tables, and the links on the right for detailed lessons. Verbs like dire and permettre are not semi-auxiliaries, because the subject is telling/permitting someone else to do something. With semi-auxiliaries, the subject of both verbs is the same.